The cockpit voice recorder from the EgyptAir plane that crashed last month has been found in the Mediterranean, Egyptian investigators say. The "black box" was damaged and had to be pulled out in several stages but its memory unit was intact, they said. 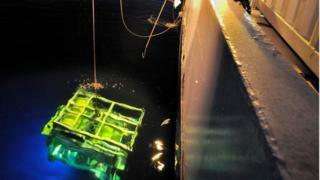 A search vessel with an underwater robot has been scouring the crash site and has sent back images of wreckage. Flight MS804 from Paris to Cairo crashed on 19 May, killing all 66 people on board. It is not clear yet what caused the aircraft to go down. In a statement, investigators said: "The vessel's equipment was able to salvage the part [of the recorder] that contains the memory unit, which is considered the most important part of the recording device." The recorder will now be taken to the Egyptian city of Alexandria to be studied. The plane's manufacturer, Airbus, previously said that finding the black boxes was crucial to understanding what happened when radar lost track of MS804. Electronic messages sent by the plane revealed that smoke detectors went off in the toilet and the aircraft's electrics, minutes before the radar signal was lost. According to Greek investigators, the plane turned 90 degrees left and then 360 degrees to the right, dropping from 11,300m (37,000ft) to 4,600m (15,000ft) and then 3,000m (10,000ft) before it was lost from radar. A terror attack has not been ruled out but no extremist group has claimed to have downed the plane. Analysts say human or technical error is also a possibility. The crew on board do not appear to have sent a distress call. The cockpit voice recorder should allow investigators to hear what the pilot and co-pilot were saying to each other, plus any alarms in the background. If the flight data recorder is recovered, it should show what the plane's computers were recording at the time. Experts have warned that signals emitted by the data recorder are expected to expire by 24 June. Investigators will begin with something they call "the four corners". It means that, before touching anything, they will map exactly where every single piece of the aircraft ended up. If debris is spread over a large area it tells them the plane broke up in mid-air. If it is more intact, it suggests it hit the water then broke up. They will also look for what is missing. If, for example, an engine or the tail is two miles away, it clearly broke off earlier in the flight. The little evidence so far suggests a fire broke out in the front of the aircraft, so they will be keen to film and photograph that area. One experienced investigator who worked on the Lockerbie bombing told me bomb damage looks very different to fire damage. Ultimately, investigators will probably have to retrieve wreckage to know for sure what brought this plane down. And that could take weeks, even months. The area in which flight MS804 crashed is one of the deepest in the Mediterranean - more than 3,000m (10,000ft) deep in some parts. Days after the search began, debris and body parts were found to the east of the plane's last known location. Egypt's military released images of debris including a lifejacket, pieces of fabric and metal fragments. On 15 June, Egyptian investigators said the deep sea search vessel John Lethbridge had found wreckage of the fuselage of the plane in "several main locations" and had taken the first images of it. A map of the distribution of the wreckage is being drawn up so a recovery operation can begin. The European Space Agency (ESA) said one of its satellites detected what appeared to be a 2km-long oil slick in the eastern Mediterranean Sea in the same area the plane disappeared.